On Saturday, I drove to Minneapolis. It's about a three hour drive from where I live in Iowa. I hate driving on the interstate. Hate it. I'm from a small town and I can usually take the highway to wherever I want to go, but not this time. I also have some anxiety when it comes to driving. 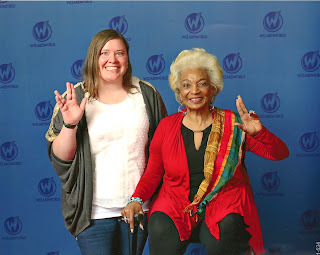 But I wanted to go to Wizard World Con Minneapolis to meet Nichelle Nichols, the woman who played Lt. Uhura in the original series of Star Trek. She's been an inspiration to me and I really admire her. I could do it. I started the drive around 2pm. It wasn't too bad, though I realized a few minutes in that my air conditioner stopped working. Alright. I could drive with the window cracked. It wasn't that hot. I made it about 50 minutes into the drive when I heard a weird rattling sound coming from my front driver's side tire. Okay. There's a small piece in the bumper on that side that's broken there and rattles when the wind goes through it. It started to make me anxious as it got louder. I couldn't take it after about ten minutes. 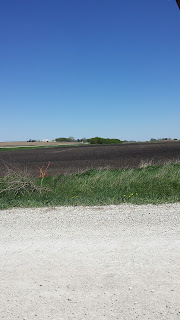 I pulled off on the first exit I could take and found a gravel road. 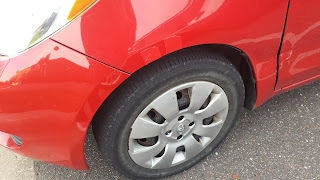 I checked the car and saw that a piece of the plastic in the wheel well had broken and was rattling. I called my dad and he said it would still be okay to drive. I bent the plastic back away from the wheel and got back onto the interstate. 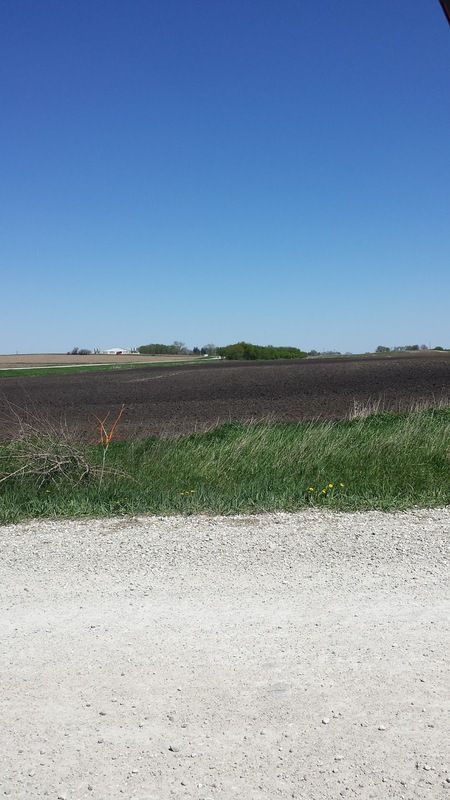 The gravel road I stopped on - it was very nice outside! The drive wasn't too bad until I got closer to the Twin Cities. Three lanes of traffic. I stayed in the middle and was okay. I got lost a few times, taking the wrong exit. The merging in and out in the city was crazy!! I could never live in a big city like that. I met my friend, Amy at our hotel. She drove from Wisconsin to meet me. We found a local place for dinner that had delicious hamburgers! We stopped by Walmart and I bought some red duct tape. Fixed that loose piece of plastic. :) It's a little redneck, but it works. We had a nice relaxing evening and we got to go swimming! Sunday morning - we went early. I picked my clothes carefully wanting to look nice for my picture. I was very excited! The traffic wasn't too bad on the way to the convention center. I was super excited!! We walked around and looked at the vendors for a while. There were so many talented people! I wish I were that good of an artist. I did see three local authors too, which was pretty cool!! Maybe I can do that someday if I ever get a book published. I met some hilarious people too! My favorite thing about being at Wizard World Con is getting to be around so many people who share the same geeky interests and aren't afraid to be who they truly are - geeks! Nerdy people. :) I love it! I didn't feel awkward or ashamed to be wearing Star Trek clothing. I was comfortable to be me! I wished I had more time to spend there! It came time for my photo. Amy headed off for some shopping while I waited in line. My hands were shaking I was so excited! :) It helped to talk to a few girls in line with me. They were pretty excited too! I ended up fifth in line. We headed around the corner to see her and there she was!! She was lovely and so sweet. I'm so glad that I got to meet her, even if it was very brief! It was worth it - to meet a woman who is an inspiration to so many. I admire everything she's done. Once I had my picture in my hand, I went to find Amy. She went to another show while I went to listen to Marina Sirtis speak. 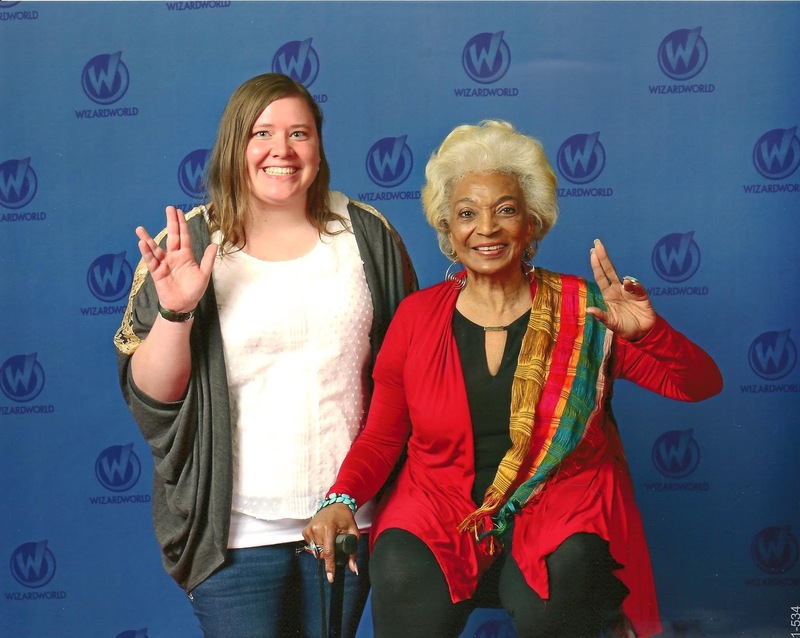 She played Counselor Troi in Next Generation. I laughed so much! She wasn't quiet like her character in the show. She was loud and sarcastic and honest! It was great to hear her answer questions about the cast and even her stint on NCIS. At the very end, she talked about how grateful she is for us, the audience. Because of our support and love of the show, she's had a good life and everything she's been given is because of those who love the show. She was in tears, thankful for the support of all the fans. We then went on a Yoga Quest. The yoga instructor went through a fanfiction story of Star Trek mirror universe while doing yoga poses. Each character had a different pose. It was funny and relaxing! I've never done a yoga quest before and I really enjoyed it. After a little more shopping, we headed out. It was so nice to be there! I wish I'd had more time. I did get within twenty feet of John Barrowman as he signed autographs. He's even more wonderful and handsome in person! I wish I could have heard his panel the day before. Sounds like you had a fun trip minus the trafiic, Although I'm sure it all seemed worth it considering you got to meet your inspiration. Hoping to see more posts from you soon.